For some reason I haven't posted here in over a year (oh wait! I was pregnant and then had a baby--been busy). Halloween was so fun this (last?) year. We had two good ideas and decided to do both! We didn't know if he would still like these characters the next year, and one of them would not have worked for trick or treating, so we went for it! 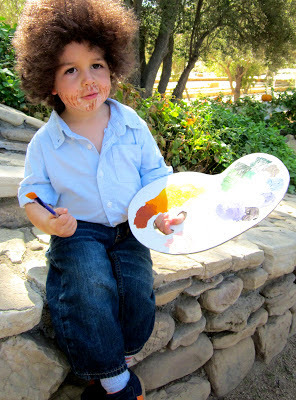 The first was Bob Ross!! 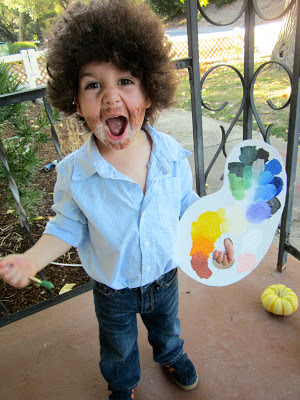 The painter from PBS. Everett really likes this autotuned compilation, for a while there, he'd watch the Bob Ross, Julia Child, and Mr. Rogers songs (in that order) every night while brushing his teeth (luckily, we've moved on). 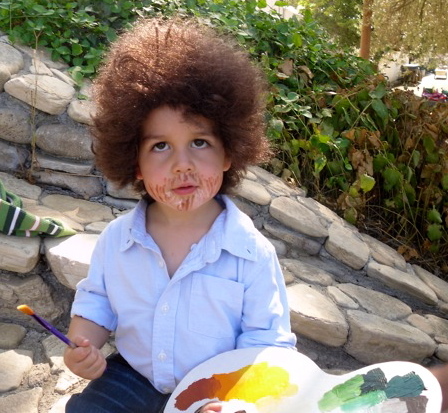 I thought it would be fun and easy to make him Bob, and I was right, but I'm really glad we didn't try to trick or treat in this, mostly because the wig stayed on for 10 minutes at the longest, and I think it's too much to expect a 2 year old to carry props. But we got some great pictures. We tried the costume on first at a local pumpkin patch. It was fun, but after seeing the pictures, I wanted to make some tweaks. Trim the wig more and draw on a thicker beard. So that's what I did, and took some pictures at home. I'm most proud of the palette. I cut cardboard that was already white and painted the colors with acrylic paint. 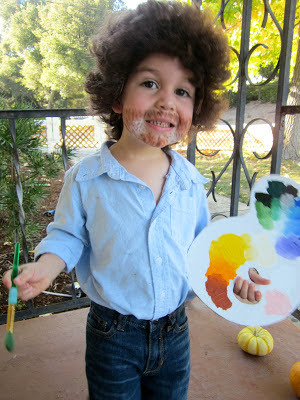 Immodestly, I think his palette is the best I've seen of any Bob Ross costume. His hair is a different matter. I couldn't find a kids' afro wig online, so I bought an adult wig and trimmed it. The size of the cap was no issue. In fact, it was quite small. Not sure it would have fit me or my husband well. But these cheapo wigs are not meant to be trimmed, so it got pretty ugly as it got shorter. I think the other (crazy) moms who've dressed their kids as Bob Ross have used shorter adult wigs. They're not really afros on adults, but they look pretty good on the kids. Well, we got a kick out of it. And someday Everett will think the pictures are pretty funny, I'm sure. 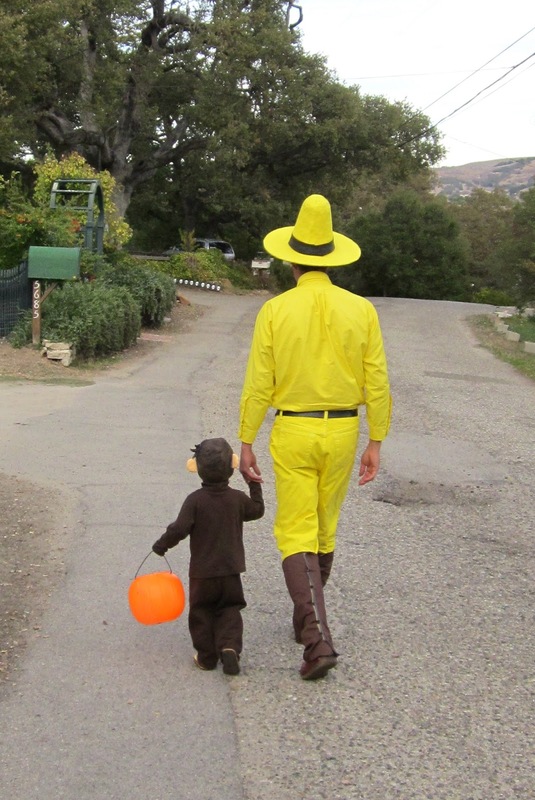 His second, "real" costume was Curious George!! And Brian was the man with the yellow hat! 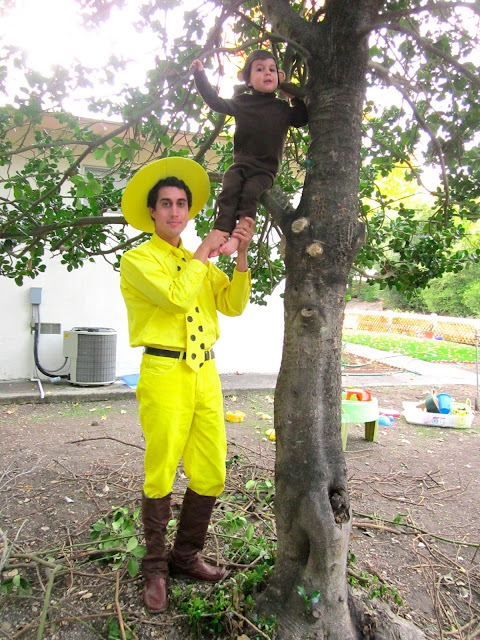 At the time, Curious George was definitely Everett's favorite character, and considering his size, and Brian's physicality, I thought they were perfect costumes. It was quite a lot of work, but it's always so hard to know that beforehand. I found Brian's shirt and pants at Goodwill. A white 100% cotton mens dress shirt and white 100% cotton womens jeans that I dyed yellow. The tie was a white hemp tie Brian already had (but never wore). Along with the clothes, I dyed a few yards of thick cotton material I later used to cover the hat. Luckily, Lemon Yellow Rit Dye was the perfect color, so I didn't need to do any mixing. I did dye the shirt twice because it didn't come out as saturated as the other pieces the first time. Unfortunately, all that dying and rinsing in hot water and trips through the dryer shrunk it a bit, so the arms were a little short. Bummer. I made the polka dots on the tie with a sponge I cut to size. I then had to fill the dots in with a brush. I used acrylic paint. There are two Curious George variations, the book and the new movies/TV show. For the new versions, they redesigned George and the man a bit. One difference is the tie. In the books, the man has lots of little dots on his tie. In the new version, he has just a few big dots. I decided to go somewhere in between, because I thought it looked best. When I designed the George cap for Everett, I went with the new version with the widow's peak and the hair sticking out the side. I just thought, the more identifying markers the better. I got the sweatsuit from Walmart. Halloween seems to be the one time of year I go to Walmart. And although I wasn't looking for it specifically, I'm glad my only option was a turtleneck. It worked well. I made Brian's hat out of paper mache. I covered and bucket in plastic (first putting a bit of cotton on top to encourage rounding), and paper mached with strips of newspaper over the bucket, then attached a cardboard brim. I paper mached the hat to the brim with the newspaper strips. Then I made a paper mache "clay" with the same newspaper, water, and flour (but torn and swished up) to even out the bumps in the hat. When it was all dry (it took a few days), I covered the hat with yellow cloth. I had enough material that I covered it twice to help smooth it out more. That may have worked a teeny tiny bit. I made a band with extra material from the monkey cap and painted it black (I didn't have any black material). I did all the hat covering with hot glue. With hindsight, I would have tried to make the hat a lot more comfortable. The head opening wasn't quite big enough, so Brian had to hold his head a certain way to keep it on. It was also very heavy with all the layers of paper mache. I didn't realize how awful the hat was to wear until the Halloween festivities were over. We were walking back to our car and I put it on. Ouch! I couldn't stand it for 10 minutes. And my husband put up with it for days without complaining. What a guy! I can also say "what a guy!" because Brian did all the sewing! My 1964 Singer Featherweight decided a while ago that it hates me, and for years, anything I've tried to sew has been a frustrating disappointment. Brian's pretty mechanical, and I asked him to take a look at it as a machine. He got it to work, but whenever I would try, things would seize up again. So he banished me from the machine and just had me instruct him on what to sew. I won't go into how I designed the monkey cap and Brian's spats (we couldn't find or afford the appropriate boots). I'm not a seamstress at all, and it involved a lot of trial and error and nothing was perfect, not even close. Looked good, though! I painting his ears instead of trying to find the exact color fabric. I'm really happy with how everything came out. Another successful Halloween costumed! The yellow man/George costumes met a sad/strange end (?). I offered them to the ladies on a local online mommy forum I'm a part of. One sweet woman said she was interested. She lives in Nipomo, so when we went that way to visit Brian's grandfather in Guadalupe, we left a bag on her doorstep. Well, turns out, it wasn't her doorstep. We left it at the right number one street over. Oops! What a weird thing to find on your doorstep with no explanation!! It's so absurd it's funny.